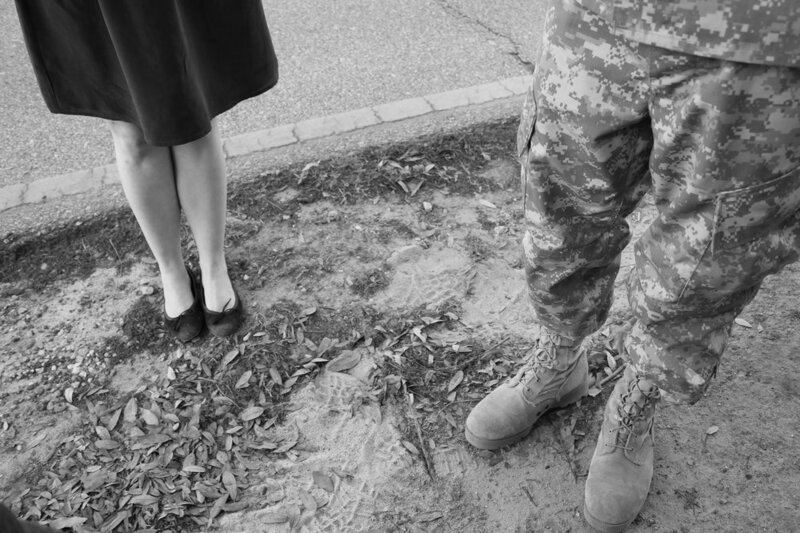 Recently, I published a short essay about saying goodbye to my husband before his first deployment. The piece is, as you might imagine, a crier, and it evinced a pretty strong emotional reaction in some readers: many of them reached out to me, thanking me for reminding them that men and women throughout the country are continuing to endure the sorrow of separation, quietly and mostly without complaint. It was a beautiful thing, receiving that response. In writing the essay—and all the stories I’ve written about Army life—I wasn’t intending to create a bridge between the military and civilian worlds, but I was, on some level, trying to find the place where the world in which I used to live and the world I now occupy meet, where the me of now and the me of then collide. I suppose in this new life, I am still, on a daily basis, trying—and usually failing—to find that place. Writing about it is a kind of searching, a way to sit down with this life in its quieter moments and sift through its contents. When I left New York City and my full-time job there as an editor, I plunged eagerly into the Army Ranger community in Columbus, Georgia, where my husband is stationed. This was partially out of writer’s curiosity, but mostly out of an urgent need to survive: two weeks after we moved here, after we’d spent a year apart, my husband left for his first deployment to Afghanistan. I had to make friends; I had to show up for the “Welcome Home!” sign-making gatherings; I had to go to the company Christmas party and get to know my neighbor, the wife of one of my husband’s friends, because she would be my lifeline to the world. It seemed, at the time, if I didn’t plunge, I’d feel more acutely the fact that I’d been thrust into a world in which I did not belong, a life I resented, a life I wasn’t guiding. But lately, I find myself pulling back: from the FRG (Family Readiness Group) meetings; from chances at new friendships with wives; from weekends of “mandatory fun” and spouse retreats. The novelty has worn off, and now, these gatherings are often a painful reminder that I am still an outsider here in the South and in the Army: that I am, no matter what I do, out of place. When we moved here, my husband wanted to live off post because it would allow him to have a private world to escape to at the end of the day. “I’ll feel like I’ve never left work,” he said when I brought up the possibility of living on Fort Benning. I wasn’t sure that I wanted to live on post either, but the writer in me was curious at the time (the conversations heard through the thin walls, the gossip exchanged over fences, the quiet of the streets when whole divisions deploy). “You might as well get something out of it,” a writing friend said to me. But I’m thankful for the separation now, to have this little universe of ours where there’s no military insignia, no daily pledge of allegiance or framed photos of commanders but instead photos of us before Andrew went into the military, his hair wilder, his frame smaller. There are Army artifacts here – backpacks and ratty old Army boots and sub-zero winter jackets for Afghanistan – but most are behind closed doors. Instead, the objects we have on display are those that have been in both our lives and relationship much longer: our absurd number of books, disorganized on an array of mismatching bookcases; the Goya print I gave Andrew for his 25th birthday; the display of photos of Andrew’s father, made in dedication to his father after he died; the Javan batik of Rama and Sinta that my father gave us to bless our relationship when we visited him in Indonesia, where he lives. These tell the longer stories of our lives, and I cling to them now, just as I cling, lately, to the chapters of my story that came before this one. Since publishing that essay, I’ve begun writing further into my past, getting lost in the worlds I knew before this one, entering them entirely, like a dreamscape: the seashore hikes I used to take with my father in Point Reyes, long before he left for another country; the winter light coming through the windows of the little Maryland row home where my husband and I lived briefly years ago, when our relationship was still timid and new; the summer the two of us spent as wood workers in the Ontario outback, living in a cabin without running water and electricity, waking in the stillness of early morning, snug in wool socks and sweaters. It’s writing as nostalgia, writing as longing for a time and place and version of myself that I’m afraid at times will be eclipsed entirely by my new world and role. Or maybe, too, it is also a kind of sifting through the contents, an attempt to trace the steps that got me here, a way of making sure that I haven’t left that girl in the Ontario woods behind. These are extremely personal reasons to write, but this compulsion is professional in nature, too—it’s an attempt to safeguard against boxing myself in as a writer. Because lately, as the financial cushion I brought with me from New York has dramatically thinned, I’ve been looking for more paying work, and, after connecting with a few military wives who are writers and reporters for publications and sites like Military Spouse and Military.com, I’ve started thinking, “that makes sense, I could write for them.” And yet, I hesitate. I haven’t pitched any of them. I wonder and worry: Do I want “Army Wife” to become my – forgive me, there’s no better word for it – brand? I’ve made deliberate decisions throughout my adulthood to stay as far away as possible from that word, “brand,” which has always left a bad taste in my mouth. But it seems to have become the paradigm of my generation, an unavoidable fact of living in the digital age (I’m not a fan of that phrase, either). Brand yourself – like cattle! – on Twitter, on Facebook, on your website, in cocktail conversation, at conferences. It’s something all of us probably devote a little bit of time to thinking about, especially if we’re trying to make a living as writers – because, let’s face it, for all but a lucky few, making a living requires a certain amount of strategy, cold calculation, and resigned willingness to do a certain amount of drudge-work. It also requires, for many of us, a narrowing. I can hear old journalism professors clanging around in my head: Find your niche. I hadn’t thought about this when I first began writing about being an Army wife. I was writing because not writing about it would have driven me crazy. It was the only way I knew how to process the sudden goodbyes, the quiet waiting for bad news, the silent weeks that go by without even the mercy of a single phone call – the new life that, after two years, continues to feel brutally brand new. Having a substantial amount of time to do this kind of writing has been a luxury I didn’t have in New York; this was the kind of work I used to relegate to the edges of my life, bleary-eyed four a.m. sessions before heading into the office. But now that I’m thinking more strategically, looking at the paying gigs that would be easier for me to get, I find myself uncomfortable with the idea of being known professionally as a soldier’s wife. I worry about writing myself into a corner and not being able to write my way out of it. The other week, my old boss and I were talking about a short profile that a reporter at Military.com did about me after reading the essay I wrote about my husband’s first deployment. I was honored, and the interviewer became a new Army wife friend, so it was well worth doing. But somewhere inside me was a slight sensation of unease, this worry that I had overtly branded myself, announced myself as Simone Gorrindo the Army Wife and there was no going back. “That’s true,” I said a little hesitantly. And that’s just it: In this new life, I am always The Wife. I am always introduced as such, branded as such. And so the uneasiness of the possible “branding” stems from this: I’m tired of being The Wife. I miss being The Editor. The Writer. The anything of my own that came before this life. Wife is worn in this world as a badge of honor, and, for the most part, rightfully so: the Rangers are the only unit in the army that has been deployed nonstop since the beginning of the Iraq and Afghanistan wars, and throughout it all, the wives have held it together, raising kids, holding full-time jobs, waking to their children crying in the night, having to look them in the eye and answer the question, “Why is Daddy always leaving?” It’s exhausting stuff, and I was particularly pleased to see one wife, a good friend of mine who’s endured more than ten deployments, receive two awards recently. It doesn’t happen often enough; it should happen more often. There’s nothing wrong, absolutely nothing, with this status, and I am honored to carry it. But it’s still a possessive title, perhaps illustrated most directly in our subtitles: we’re dependents, our presence in this world is sponsored. To access any information, to make a medical appointment, we don’t give our social security numbers but our husbands’. Without the number, we’re cut off, cut loose, and it’s hard not to think how precarious this standing can be; it’s hard not to think that this isn’t my world, that I’m just a guest in it. I won’t be a Ranger wife forever. And then, what will be my “brand”? Who will I be? How much, in making this transition, have I left behind, not just as a human being but as a writer? In Tiny Beautiful Things, Cheryl Strayed talks about sister lives—the beautiful and important lives we don’t choose—and I’ve wondered, at times, about sister stories, too, storylines that could have played out much differently on the page if we had made different decisions along the way. These shadows that trail us on the street, in our bedrooms, on our plane rides and drives along the coast, they must trail us, too, in some form, as we write. There’s an essential difference, though. As human beings, it’s not possible for us to move backwards, to return to old plot points in our lives and see where the alternative routes take us. But I wonder if we can as writers. Maybe I don’t have to leave so much behind; maybe there is no possible way to write myself into a corner, because, on the page, in our imaginations, in our minds, there are no corners, only a kind of infinite and unconfined space. That freedom of movement made me fall in love with writing. But that’s the four a.m. writing I was talking about. In my experience, writing to make a living tends to have very sharp-edged corners, and provides us a space to move around in that is only as big as our bank accounts. So the task before me now is to find a way to move between the open space of writing for love and the constricted space of writing for a living; to find a personal and professional identity outside of the Army while still embracing my Army life; to write what feels true, even if that means branding myself sometimes as an Army wife; to live this life I’ve chosen but not forget about those sister lives, those ghost ships that we can only, as Cheryl Strayed writes, salute from the shore. There is something private and burning that links these separate selves and lives; I’ve carried it from New York to Georgia, from editor to Army wife. From the life I lived before this, with its wide avenues and congested subways and desperate, impossible dreams, I smuggled out my own desperate, impossible dream and brought it here to my little brick house in Georgia, to this quiet life of evening walks around the park with the dog. And I have found the time and space to inch a little closer to that dream: to spend my days writing, for love or for money. And maybe one day, those two paths will merge; maybe, if I keep working towards it, I’ll discover a way to make a living writing without having to narrow that wide-open landscape into a fenced and tamed piece of land.